In a somewhat surprising turn of events, The Economist in its May 23rd edition, published a piece with no name attached, where it labeled the idea of a basic income for all as "basically unaffordable." It then followed the publication with share after share via social media, with tweets such as "Why a 'basic income' for all is a bad idea for all", and "Why the Green Party is wrong to support a 'basic income' for all." All of this would seem pretty damning to the many becoming recently interested in learning more about the idea of a universal basic income -- that is the idea that each and every citizen should be provided an income floor sufficient to cover life's most basic needs like food and shelter -- if The Economist had not curiously undermined their case by simplistically basing their entire argument on a single equation. If important economic discussions were really as simple as discounting entire areas of study with a short paragraph involving a single equation, there wouldn't even be a need for The Economist to exist in the first place, now would there? Imagine if all of this back and forth about increasing minimum wages could be ended by just pointing to an equation written half a century ago. We can't do that though, because minimum wage discussions involve a lot of variables, and study after study has been published about them. Study after study has also been published about the idea of universal basic income over the years, and if we extend the discussion to unconditional cash transfers, the discussion involves piles of papers from hundreds of academics across multiple fields of science and economics. And this is because the idea of basic income, although seemingly simple sounding, is a very complex discussion in which to engage. So let's dive into the complexities that The Economist entirely ignored, shall we? In 1970 James Tobin, an economist, produced a simple formula for calculating their cost. Suppose the government needs to levy tax of 25 percent of national income to fund public services such as education, policing and infrastructure. Paying for a basic income worth 10 percent of the average income requires average taxes to rise by ten percentage points, to 35 percnet. A basic income worth 20 percent of the average income requires average taxes to be 20 percentage points higher, at 45 percent, and so on. 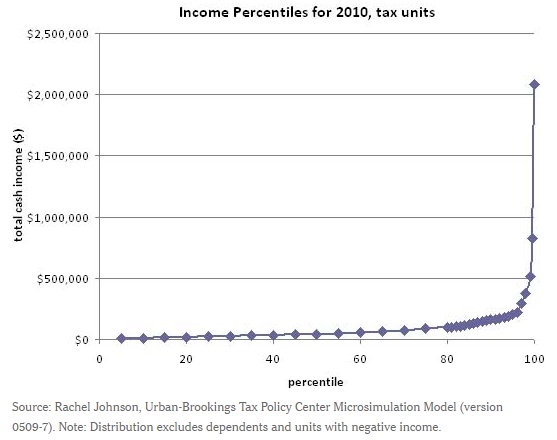 Eradicating relative poverty, defined as income beneath 60 percent of the median, would require tax rates approaching 85 percent. The heart of The Economist's argument therefore lies in the belief that if 25 percent of everyone's income tax goes to fund government, then a basic income given to all, of sufficient size to raise everyone above the federal poverty line, would require raising everyone's taxes an additional 60 percent to a new grand total of 85 percent. This is the entire argument. And all of the following is what it ignores. Due to how far our income distributions have skewed in the past half century, it should be no surprise that average incomes have shifted upwards considerably, while the median income adjusted for inflation has actually fallen. So whereas Tobin could have been considered safer in making such a statement in the 20th century, we can't make the same statement in the 21st century, because our income distribution now looks like this. With a chart like the above in mind, let's not even look at the average and instead look at the total of all income in the US, and that's $8.4 trillion. So, if we wish to discuss a universal basic income of $12,000 per adult and $4,000 per child, which is the least expensive design possible capable of eliminating poverty across all household sizes, this would cost about $3 trillion and therefore require an additional income tax of 35.7 percent. Nowhere near 60 percent is it? What about all our current spending? Those blue bars basically represent the universal basic income we already have, which remains mostly invisible even to those receiving it, save for those in the lowest quintile who get to experience the full extent of the federal bureaucracy we put in place to administrate it. 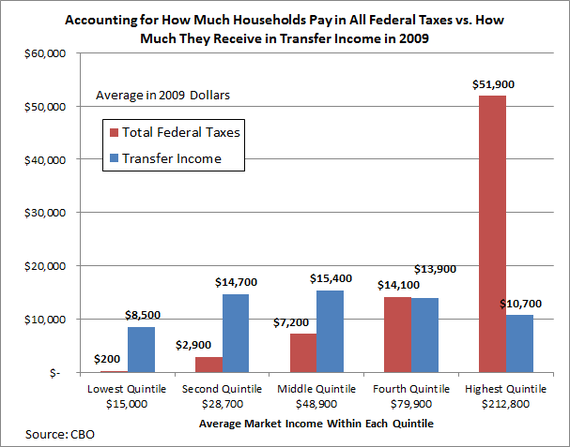 For the most part, those in the higher quintiles receive their transfers without ever thinking of them as transfers, like the mortgage interest rate deduction for example. Now, to be fair, a basic income would not entirely eliminate each of these blue bars, as these bars include programs like Medicaid which would be inadvisable to eliminate with basic income. But a great deal of money can be saved by eliminating a substantial portion of them. By my own calculations, we could eliminate about $1.5 trillion dollars of spending on present programs. So going back to the $3 trillion estimate of UBI, it would actually be more like $1.5 trillion. And so again using total income for our calculation, we would require an additional income tax of not 60 percent, or even 35.7 percent, but 17.8 percent. One might now think The Economist is already pretty much as far off as they could possibly get in their calculation, claiming 60 percent instead of 17.8 percent in additional taxes, but this estimate is built off of a flat tax universally applied. We don't actually have flat income taxes, so in reality, the additional 17.8 percent could come in the form of a higher increase for the top quintile, with no increase for the bottom four quintiles. But let's instead pretend we use a flat income tax to fund a UBI. Imagine someone earning $20,000. To fund their basic income, we would need to raise their taxes by 17.8 percent, but let's use 20 percent for ease of calculating. Their tax burden goes up $4,000. However, because they also receive a basic income of $12,000, they actually see their overall tax burden decreased by $8,000. For them, the UBI is essentially a giant tax rebate. 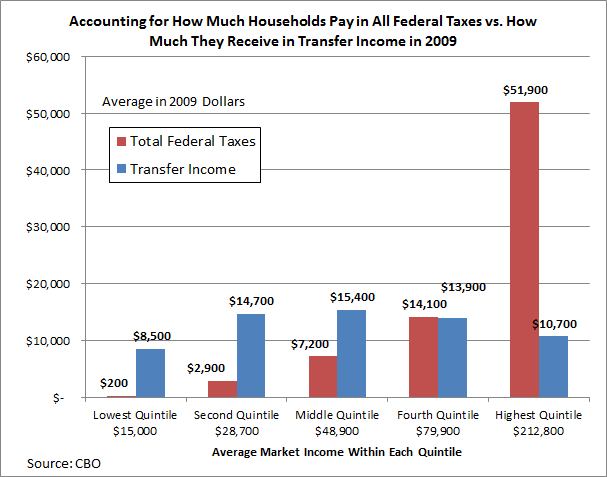 If their current tax burden is $2,000, their tax rate before basic income is 10 percent. After basic income, their tax rate is negative 30 percent because they end up with $26,000 for earning $20,000. This is how a universal basic income would actually work. Because inequality has reached such extreme degrees, and because we already spend so much money on existing government programs no longer necessary with a basic income for all, the required price tag is not an income tax increase of 60 percent. It's not even an income tax increase of 35 percent or 25 percent. It's a potential income tax increase of under 20 percent. And because a very small amount of people have an almost unimaginable amount of money at the very top, a basic income could actually decrease almost everyone else's income tax burdens except for theirs. Keeping in mind our present level of inequality and its negative effects on economic growth, this is actually even exactly what the richest should want, because although they would pay more in taxes for universal basic income, leaving them a slightly thinner although still very thick slice of the overall pie, the slice of the pie itself would grow, leaving even them better off as well. This is largely due to economic multiplier effects where $1 given to those with lower incomes has three times the growth effects on GDP as giving the same $1 to those who already have a great many dollars. Meanwhile, as if all of the above isn't enough to show how affordable a $1,000 per month universal basic income actually is, it's vital we understand just how much less we can spend as a society, simply by preventing all the costs of poverty that we'd never have to pay in the first place anymore. And if we also care about what we're going to do about all the jobs technology stands to eliminate in the years ahead, we should definitely care about figuring out how we can all be better off in an economy that actually works better with fewer jobs instead of worse off in an economy that's fundamentally broken. It's disappointing all of this economic complexity in regards to the affordability of basic income is nowhere to be found within The Economist. For this is a discussion we need to be having, and not one to be so easily dismissed as too expensive. Instead, we should consider the distinct possibility that continuing on without basic income is what potentially carries the highest price tag of all. Scott Santens writes about basic income on his blog and is actively crowdfunding a basic income on Patreon. You can follow him on Medium, on Twitter, on Facebook or on Reddit where he is a moderator for the /r/BasicIncome community of over 27,000 subscribers.